*Warning- This post contains 'graphic' pictures. Beware, oh ye of weak stomach. So... Thursday night, I was finishing up a batch of chicken broth when I burned my arm. It was burned my wrist to my elbow, although only about two inches of it was burned enough to still be showing the next morning. That blister turned into a nasty cesspool of infection today. Now, in February, I hurt my hand, a minor injury that they cleaned out at the emergency room and bandaged. That wound also turned into a cesspool of infection. In fact, every wound I've gotten over the last seven months has gotten infected. And swollen. And itchy. Now, I'm allergic to latex. I've known this for about 10 years, and I take care to avoid latex in bandages. What I didn't realize is that I'm allergic to something else in bandages. Perhaps it's the adhesive. Perhaps it's in the pad. I don't know, but for whatever reason, I'm having allergic reactions to bandages. Today, after going to the doctor, where she immediately put me on antibiotics (I'm not exaggerating when I say my burn had caused my arm to swell 1/2 inch), slathered me with silvadene ointment, and popped a latex free bandage atop it, I went to the pharmacy to get my prescription filled. 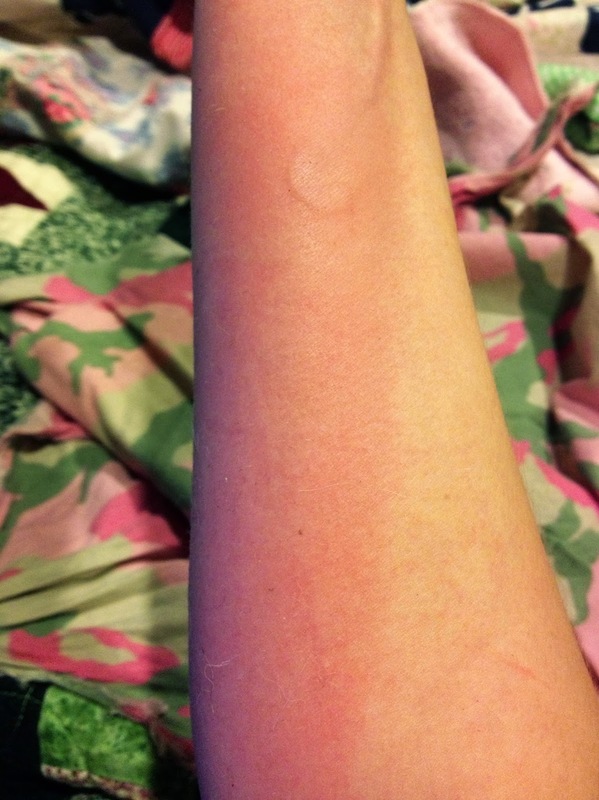 By the time I arrived, my arm had swollen and was itchy, red, and burning. Oh yes, I was having an allergic reaction to something. I immediately went to the pharmacist and showed it to her and asked if I could be having an allergic reaction to the silvadene. She said to take the bandage off because it looked like I was having a reaction to the bandage. Sure enough, by the time I got home, all the swelling, redness, itching, and burning were gone. That redness to the right? All from the bandage. I bought some stretchy webbing to wrap around a bandage to keep it in place and popped it on. By the time I got to my next appointment, 30 minutes later, my arm was once again red, itchy, and burning. I took it off, and once again all that stuff went away. Dominic suggested I just rip some cloth to tie around my arm like they use to do. So, now I'm sitting at home high on Benadryl and azithromycin with an old school bandage on my arm. I think I'll make myself some bandages and sterilize them for future use. And I have to laugh, really, because this is such a minor thing. And isn't it better to learn about allergies this way than in the middle of a surgery, as my dad did? And, hopefully, when I'm canning tomorrow, I won't cut myself and need stitches. My luck, I'd be allergic to the thread.